Availability: This product is discontinued and no longer available for purchase. For alternatives browse our Cybex Fitness department. Cybex 750C IFI Upright Cycle with PEM has a professional standard of construction and the very best features to cater for advanced users. It boasts a self-tensioning drive with a wide resistance range from 20 to 900 watts. 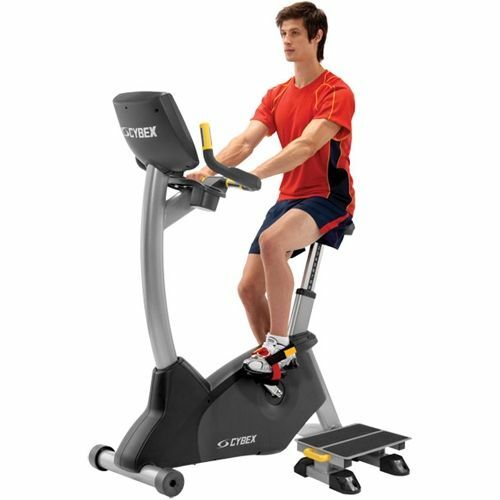 This exercise bike also features extra wide double sided pedals and a very comfortable seat designed to keep you cool and comfortable on any length of ride. There are 9 programmes with 21 different levels to challenge and motivate you towards a greater level of fitness or even to be in perfect shape for the Olympics! This machine also has a Personal Entertainment Monitor (PEM) which allows you to connect your iPod, track your workouts with Nike+iPod, or just watch TV! This model of the 750C cycle is IFI (Inclusive Fitness Initiative) accredited which means it is appropriate and user-friendly for both disabled and non-disabled users. for submitting product review about Cybex 750C IFI Upright Cycle with PEM.